Lifting high the cross in historic downtown Easton since 1740. St John’s is in the very heart of the historic part of Easton. The history of the church parallels the history of the Forks of the Delaware. Plans for Easton began in 1737 by William Penn. The first German Lutheran settlers began to occupy the region and were served by missionaries and preachers. Painting of the church, circa 1850, showing wall which enclosed the Lutheran cemetery surrounding the early church building. The steeple is an earlier version than the present one and earlier chimneys project through the roof. Near the forks of the Delaware and Lehigh Rivers of Easton, PA, early German Lutheran settlers and their family and friends met in worship to God. The first minister, John J J Birkenstock began to keep records of the Lutheran congregation in 1740. This date is commonly accepted as the founding of the church. In 1755 German Lutherans and German Reformed shared a log school house for worship. In 1776 they built a stone church. In the early 1800’s the Lutheran started a church for African-Americans which later merged with St. John’s. 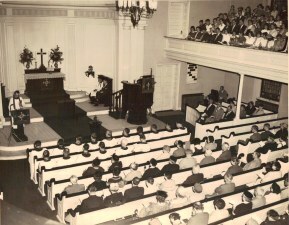 The congregation continues to be multi-racial and multi-cultural to this day. 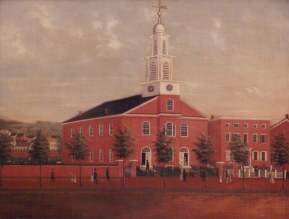 The Lutherans laid the cornerstone for their own church building (the present one) in 1830 on the corner of Fourth and Ferry streets. A Sunday School facility was added in 1889 over a portion of what was the cemetery, preserving some historic gravestones in the ‘grave cellar’. On Heritage Day, the ‘grave cellar’ is opened for visitors. In 1962 as other downtown congregations were moving to the suburbs, the former German speaking congregation, Zion Lutheran Church, and St John’s chose to remain in the city and they reunited. St John’s has a rich history of caring and serving the community. In 1908, St John’s hosted a daily kindergarten. In the 1960s with reaction to crime in the streets, leaders including those from St John’s and others from various faith backgrounds (Protestant, Jewish and Catholics) formed ProJeCt. We continue to support ProJeCt of Easton and they utilize the church’s buildings for their work (including offices and a food pantry). In 2008, St Peter’s Lutheran Church, from the College Hill neighborhood of Easton, united with St John’s to continue the ministry important to Lutherans in the city. We continue to be a church in the city and for the city.